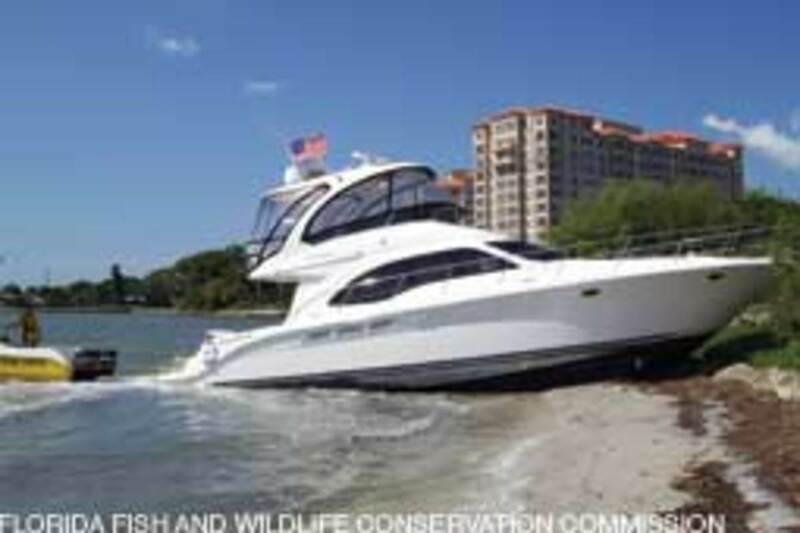 A Florida man’s 52-foot motoryacht ran onto a beach after he left the flybridge helm and fell overboard at 20 mph crossing Sarasota Bay, according to the Florida Fish and Wildlife Conservation Commission. Operating alone, Edward Webber, 55, of Longboat Key, was unharmed. The Sea Ray ran onto a beach less than 100 yards from a public boat ramp about 2 p.m. April 20, FWC officer Robert O’Horo says. 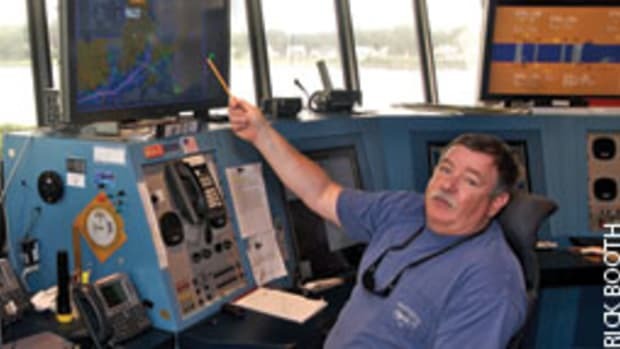 He says Webber violated at least one Coast Guard navigation rule, Rule 5, which requires the skipper to maintain a lookout. In Florida, a nav rule violation resulting in an accident is a second-degree misdemeanor, he says, which carries a maximum penalty of 60 days in prison and a $500 fine. O’Horo says he will give his accident report to the state attorney’s office, which will determine whether Webber will be charged. Webber says he was running from his dock on Longboat Key to a MarineMax dealership to fuel his 2007 Sedan Bridge — about a 4-mile trip. 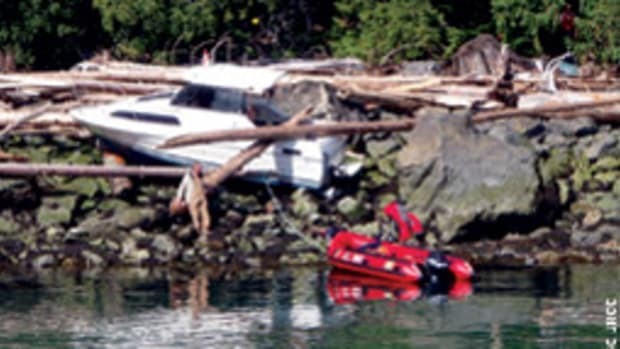 He was cruising under autopilot on flat water with no other boats in his vicinity, he says. An avid diver, he left the helm to collect a loose dive ball — with 100 feet of nylon line attached — on the aft deck, where the transom door was open. Before leaving the helm, Webber had adjusted the autopilot to turn to starboard a few degrees. “I don’t know why I did this, but it may have saved the boat,” he says. Sea Tow operators retrieved it at high tide the next day. It was towed to MarineMax. More important, O’Horo adds, the mishap illustrates why boaters should never leave the helm when a vessel is under power, especially on inshore waters. One person died and one was missing after a 22-foot sailboat capsized May 13 on the James River off Portsmouth, Va., with 10 people on board. 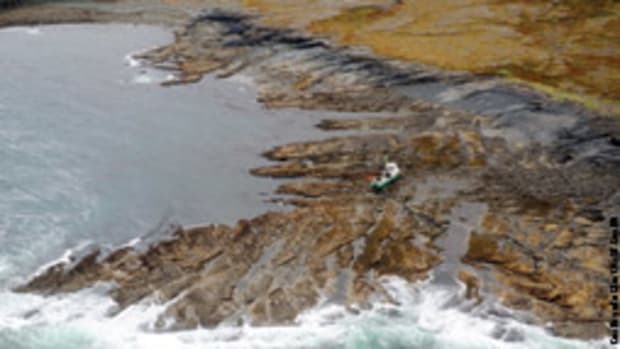 Multiple crews searched about 23 square miles for the man, and the Coast Guard suspended its efforts after 14 hours. 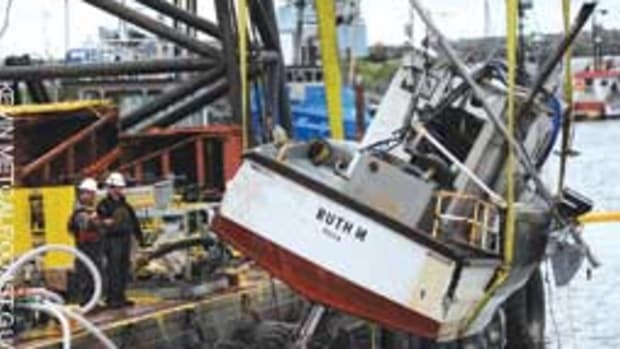 At 3:43 a.m., the operator of the tug Robert Burton reported to Sector Hampton Roads that it had collided with what appeared to be an abandoned, unlit sailboat in the James River channel about 6 miles north of the James River Bridge. The Coast Guard says it believes the sailboat was struck by the tug more than three hours after it had capsized, according to a news account. The Coast Guard had responded to a 911 call from one of five people who made it to shore after the boat flipped. The remaining four were found in the water and rescued. One person later died at a hospital. 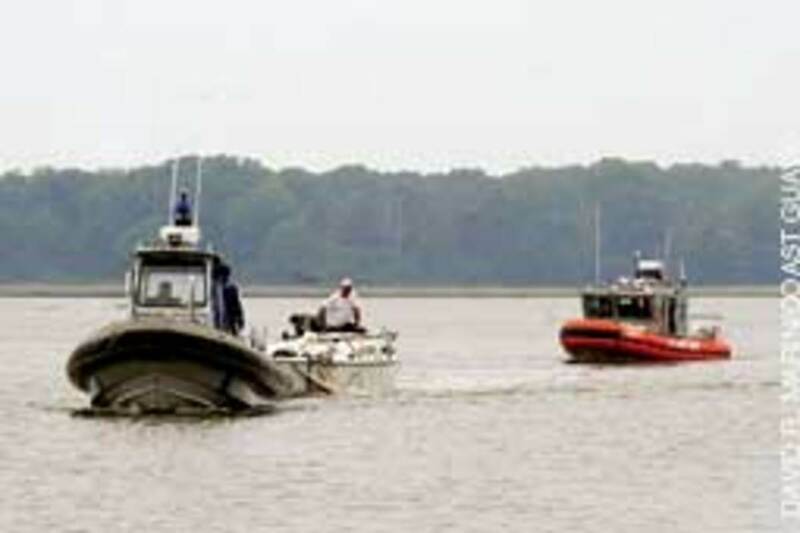 The Virginia Marine Police continued its search for the missing man and was investigating the incident. Most of the people on the sailboat were based at the National Institute of Aerospace in Hampton Va., which is affiliated with NASA’s Langley Research Center, according to reports. The Coast Guard rescued a 37-year-old man and his 4-year-old son from an overturned sailboat May 14 about 300 yards north of Anclote Key, Fla. At 2:13 p.m., Sector St. Petersburg, Fla., received a DSC alert from the boat’s VHF radio. A Station Sand Key 25-foot response boat-small crew launched at 2:15 p.m. It arrived about 3 p.m. and saw the overturned boat and two life jackets in the water. The crew was unable to reach the sailboat because of inclement weather and shallow water and notified Sector St. Petersburg, which launched an MH-60 Jayhawk helicopter from Air Station Clearwater at 3:40 p.m. that arrived 10 minutes later. The man and his son were hoisted into the helicopter and brought back to the air station, where they waited for family members to pick them up. The Coast Guard rescued four boaters May 14 after the 25-foot sportboat they were aboard capsized off Cumberland Island, Ga. The Coast Guard received a mayday call over VHF channel 16, followed by an EPIRB notification, after the boaters capsized. All on board were wearing life jackets. The crew of the 87-foot cutter Sea Dog rescued the boaters, who were transferred to a Station Mayport 45-foot rescue boat. The Florida Fish and Wildlife Conservation Commission, the Jacksonville Sheriff’s Office and the Nassau County Sheriff’s Office were also involved. The Coast Guard and a good Samaritan rescued six people May 9 from an overturned 25-foot power catamaran near the fairway anchorage at the Sunshine Skyway Bridge. Sector St. Petersburg received a report at 7:51 p.m. via VHF channel 16 from people aboard the commercial vessel Regal Star that they saw a life raft with six people on board near the anchorage. 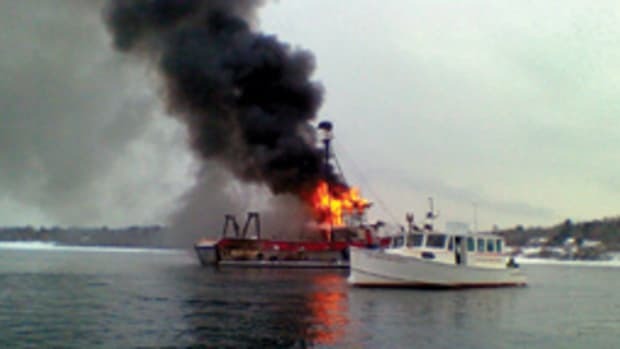 The commercial vessel Wyatt Lee overheard the initial transmission, contacted the Coast Guard and volunteered to help. About 8 p.m. a MH-60 Jayhawk helicopter crew from Air Station Clearwater, Fla., was diverted from a patrol, along with a 45-foot Response Boat-Medium crew from Sector St. Petersburg. The helicopter arrived shortly after 8 p.m. and notified the watchstanders that the six people, all wearing life jackets, were sitting on an overturned catamaran. The Wyatt Lee arrived shortly thereafter and safely recovered all six people. 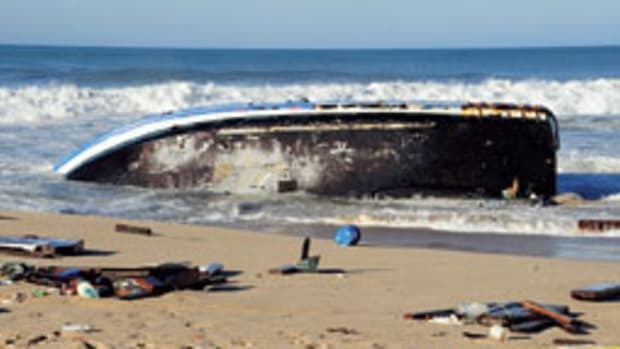 The catamaran’s owner contacted commercial salvage to recover the overturned vessel. No injuries were reported. The Coast Guard medevaced two people from a boat that struck a submerged object about 6:45 p.m. May 3 near the Throgs Neck Bridge on the East River in New York. The Coast Guard received the initial radio distress call from the operator, who said the 57-footer was taking on water. Sector New York contacted harbor units from the New York Police Department and the New York Fire Department, and they were on the scene shortly afterward. TowBoatU.S. also was there shortly after the initial call, and crewmembers began to dewater the boat. The first responders told Sector New York that two of the three people aboard were injured. 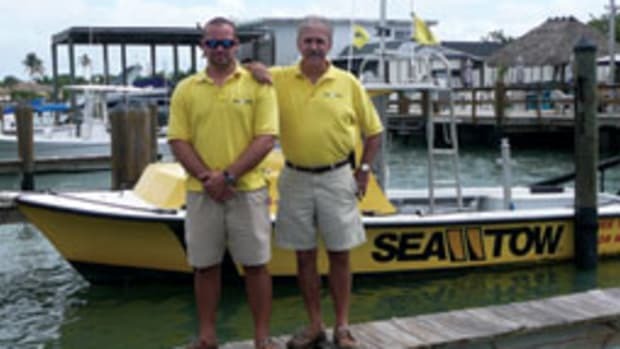 Station Kings Point, N.Y., launched a 25-foot rescue boat that arrived shortly after 7 p.m. The crew brought the two people to City Island, where they were transferred to awaiting emergency medical personnel. The Coast Guard rescued two men 120 miles southeast of Nantucket after their 45-foot sailboat lost its mast and began taking on water. The two-man crew aboard Eva called the Coast Guard Command Center in Boston via satellite phone at 1:45 p.m. May 10 and reported their trouble and that the boat’s dewatering pumps weren’t working. Winds were 25 to 35 knots and seas 12 feet. The vessel had a life raft. The men were hoisted by an Air Station Cape Cod MH-60 helicopter crew. Both were reported to be in good condition. A Station Boothbay Harbor, Maine, 47-foot Motor Lifeboat and an Air Station Cape Cod MH-60 Jayhawk helicopter responded May 1 to a 55-foot boat taking on water about a mile from the mouth of the Kennebec River. The two-person crew aboard Phoenix issued a distress call at 11:43 a.m., reporting that their boat was flooding and they needed assistance. Two crewmen from the Motor Lifeboat, which arrived shortly after noon, boarded Phoenix with a pump and dewatered the vessel. The helicopter, which was diverted from a routine patrol, lowered a second pump at about 12:30 p.m. The Motor Lifeboat escorted Phoenix to Boothbay Harbor Shipyard, where an investigation began in an effort to determine the cause of the breach. No injuries were reported. The Coast Guard rescued three men May 11 after their 64-foot fishing boat capsized in Manasquan Inlet. The men, ages 19, 30 and 38, made a distress call over VHF channel 16 at 4:53 a.m. A crewmember aboard the Atlantic Traveler reported that a hydraulic hose broke, and the boat lost its clutch and steering and was drifting toward rocks. 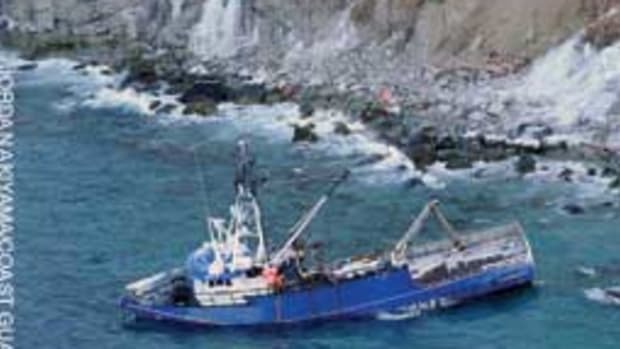 A 47-foot Motor Lifeboat crew retrieved the men and took them ashore. No injuries were reported. The Coast Guard rescued a boater after he ran aground April 21 on the Charleston Harbor north jetty. The boater told Sector Charleston at about 6:12 p.m. that his 26-foot sailboat was taking on water after the grounding. Station Charleston deployed a 25-foot response boat-small crew and a 41-foot utility boat-large crew, along with an MH-65 Dolphin helicopter from Air Station Savannah, Ga., to assist. The Coast Guard arrived about 7 p.m. and safely recovered the boater. No injuries were reported. Watchstanders at the Coast Guard’s 5th District Command Center coordinated a May 6 rescue 850 miles east of Bermuda with the assistance of the Royal Caribbean cruise ship Celebrity Equinox. At about 12:30 p.m., the Maritime Rescue Coordination Center in Bremen, Germany, notified watchstanders that five German nationals aboard a 43-foot catamaran needed assistance. Watchstanders were told that the crew was worried about running out of fuel and had a possible broken mast. Using AMVER, the automated mutual-assistance vessel rescue system, the Coast Guard asked Celebrity Equinox to help. The cruise ship, en route from Fort Lauderdale, Fla., to Europe, delivered fuel and food to the sailors. The mast was intact. The German nationals continued on their way to the Azores. A Coast Guard helicopter crew rescued a personal watercraft operator with symptoms of hypothermia May 10 in Great South Bay near Babylon, N.Y. The Coast Guard initially responded to a report of two PWC adrift, one partially submerged. The reporting boat rescued one person, but the second, who was reported to be wearing a black-and-white life jacket, was missing. The helicopter crew, conducting rescue training with a nearby Coast Guard boat crew at the time of the call, diverted and spotted the missing PWC rider near the Robert Moses Causeway. A rescue swimmer hoisted the 47-year-old man to safety. The helicopter crew from Air Station Cape Cod, Mass., transported him to Good Samaritan Hospital in Babylon in good condition. 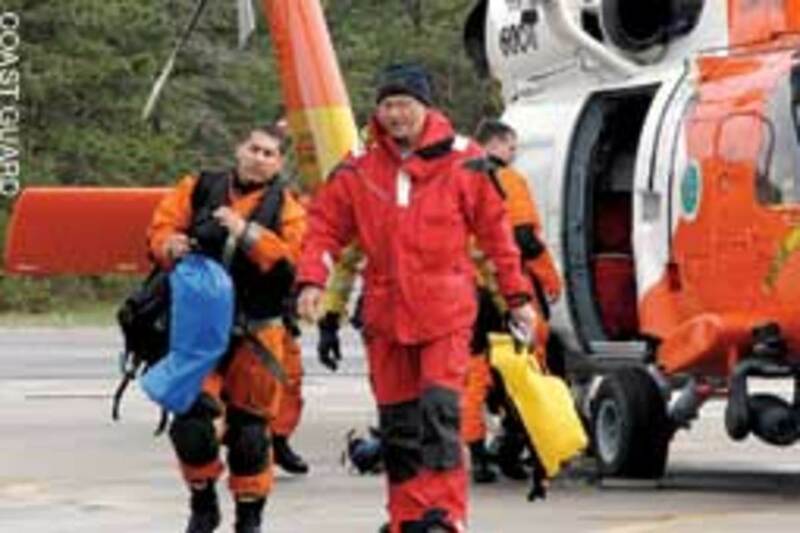 The Coast Guard suspended its search for a missing 59-year-old man at 11:50 a.m. April 30. Sector Baltimore received a call about 3 p.m. April 29 that a 20-foot sailboat was aground. A 25-foot response boat-small crew from Station Crisfield and an HH-65 Dolphin helicopter crew from Air Station Atlantic City, N.J., searched 350 square miles during an 11-hour period. The Westside fire department and police department and the Maryland Natural Resources Police also participated. The Coast Guard is seeking information about a pontoon boat that was found with its engine running at a residential pier at 8:30 a.m. April 28 near Orchard Beach, Md., on Stony Creek. Anyone with information about people missing near Orchard Beach and Stony Creek is asked to contact the Sector Baltimore Command Center at (410) 576-2525. 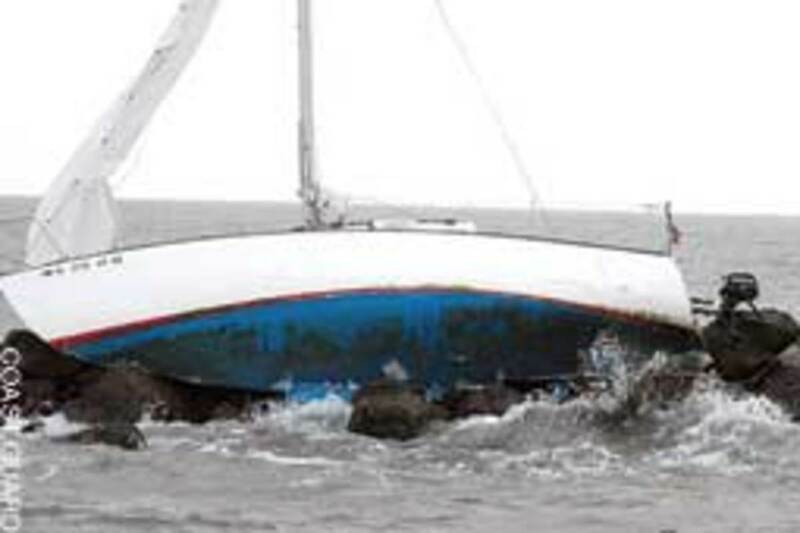 Anyone with information about the boat is asked to contact the Maryland Natural Resources Police at (800) 628-9944.